“GOSHEN, Conn. — If one were asked to pick a typical home where the buffalo roam, the answer probably would not be Litchfield County amid the rolling hills and understated rural chic of Northwest Connecticut. But when Bison No. 7 on Peter Fay’s farm gave birth to a white, 30-pound bull calf a month ago, it made the Fay farm below Mohawk Mountain, for the moment at least, the unlikely epicenter of the bison universe. For Mr. Fay, what happened was an astoundingly unexpected oddity — white bison are so rare that each birth is viewed as akin to a historic event. For Marian White Mouse of Wanblee, S.D., and other American Indians, it is a supremely auspicious message from the spirits. She will fly with her family to Connecticut for naming ceremonies at the end of the month that are expected to draw large crowds. And for those to whom the bison is an iconic part of the American experience, the birth is, at the least, a remarkable coincidence, coming at a time that wildlife, tribal and producer groups are lobbying Congress to have the bison officially designated as the national mammal and a national symbol alongside the bald eagle. (The words buffalo and bison are often used interchangeably, but the North American version is properly called bison and its distant cousins in Asia and Africa are buffaloes). Mr. Fay, who has an elaborate bison tattoo on his right shoulder and another above his heart, comes from four generations of dairy farmers and makes his living through an excavating and rock-crushing business. He began raising bison as a hobby four years ago, capitalizing on a growing appetite for bison as a leaner alternative to beef, and then became increasingly excited about the animals, building his herd to more than 40 until he sold off about half of them two months ago. Mr. Fay, 53, said he was watching a female preparing to give birth on June 16 when he realized a second one was about to give birth as well. Mr. Fay said his Indian friends had told him that a white bison was considered the most sacred thing imaginable — its birth viewed as something like the Second Coming. Mr. Fay said he carefully researched the bloodlines of the calf’s mother and father, and he is confident the animal is all bison without any intermingling with cattle. But to be certain, he has sent its DNA for testing. Keith Aune, senior conservation scientist with the Wildlife Conservation Society, said some white bison are albinos and have difficulty thriving in the wild because they lack the black skin that absorbs sunlight during harsh winters. Mrs. White Mouse, a member of the Oglala Lakota people, said a white bison was believed to be a manifestation of the White Buffalo Calf Maiden, or Ptesan Wi. She is revered as a prophet, who in a time of famine taught the Lakotas seven sacred rituals and gave them their most important symbol of worship, the sacred pipe. Mr. Fay said he was getting the idea, and being very careful. A white bison in Texas was slaughtered a year ago in what some believed could be an anti-Indian hate crime. Mr. Fay said either he or someone else watched the field day and night. He said that he was prepared for what could be four days of festivities, with the naming ceremony scheduled for July 28, and that he had no interest in selling the bison. Experts have said one in 10 million bison are white, but a few other white bison births in recent years suggest the rate is somewhat higher. There were once perhaps 40 million bison roaming wild in the United States. They were hunted to near extinction and have had something of a resurgence both because of conservation efforts in the West and commercial demand; there are now about 500,000 in the country. Less than a month before this bison was born, the National Bison Legacy Act was introduced in the Senate. The act would designate the American bison as the “National Mammal of the United States.” (There has never been a national mammal.) It has 15 co-sponsors, including the two senators from Connecticut, and an upbeat Web site, votebison.org, though its prospects for passage are unclear. Mr. Fay said he believed the Indian teachings about the animals, though he found it hard to tie the birth to any one event. The traditional story is that, long ago, there was a time of famine. The chief of the Lakotas sent out two scouts to hunt for food. As the scouts travelled they saw a figure in the distance. As they approached they saw that it was a beautiful young woman in white clothing. One of the scouts was filled with desire for the woman. He approached her, telling his companion he would attempt to embrace the woman, and if he found her pleasing, he would claim her as a wife. His companion warned him that she appeared to be a sacred woman, and to do anything sacrilegious would be folly. The scout ignored his advice. The companion watched as the scout approached and embraced the woman, during which time a white cloud enveloped the pair. After a while, the cloud disappeared and only the mysterious woman and a pile of bones remained. The remaining scout was frightened, and began to draw his bow, but the woman beckoned him forward, telling him that no harm would come to him. As the woman spoke Lakota, the young man decided she was one of his people, and came forward. When he arrived, she pointed to a spot on the ground where the other scout’s bare bones lay. She explained that the Crazy Buffalo had compelled the man to desire her, and she had annihilated him. The scout became even more frightened and again menaced her with his bow. At this time, the woman explained that she was Wakan/holy and his weapons could not harm her. She further explained that if he did as she instructed, no harm would befall him and that his tribe would become more prosperous. The scout promised to do what she instructed, and was told to return to his encampment, call the Council and prepare a feast for her arrival. The woman’s name was PtesanWi which translated White Buffalo Calf Woman. She taught the Lakotas seven sacred rituals and gave them the chanunpa or sacred pipe which is the holiest of all worship symbols. After teaching the people and giving them her gifts, PtesanWi left them promising to return. Later, the story became attributed to the goddess Wohpe, also known as Whope, or Wope. When Roman Catholic missionaries first came among the Lakota, their stories of the Virgin Mary and Jesus became associated with the legend of White Buffalo Calf Woman. The syncretic practice of identifying Mary with PtesanWi and Jesus with the chununpa continues among Lakota Christians to this day. 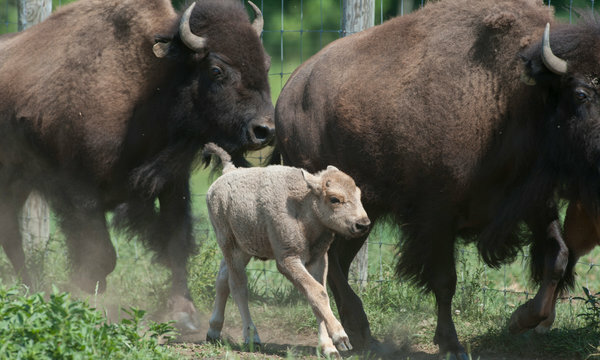 This entry was posted in News, Red Foxes (Animal Category) and tagged Connecticut, Lakota, news, Ptesan Wi, PtesanWi, Red Foxes (Animal Category), White Bison, White Bison Calf, White Buffalo, White Buffalo Calf, White Buffalo Calf Woman. Bookmark the permalink.